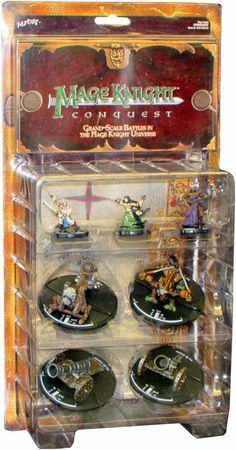 These Mage Knight figures and game aids are for the new large-scale Mage Knight Conquest game, and are especially useful for full-frontal castle assaults. 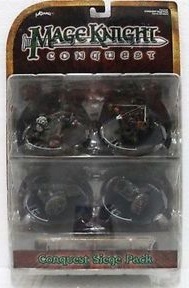 This set includes the 4 popular pieces of siege equipment from the Mage Knight Conquest pack and 3 figures. These siege units are for the new large-scale Mage Knight Conquest game, and are especially useful for full-frontal castle assaults. This set includes 4 siege units, Ballista, Mortar, Cannon, Catapult, 15 large formation movement markers, 30 movement tokens that make it easier to keep track of individual unit actions in games, and two ladders that Mage Knight figures can use for scaling walls while laying siege to Castle pieces.